What was it like to be a coal miner? For some, it was walking to your shift with fear in your belly, and a hatred for the dark, the damp and the dirt that you never got over. For others, the shared bonds of knowing that your life might be in the hands of your buddies or theirs in yours, and that you inhabited a world known only to yourselves, made it an irresistible workplace. For most, it meant starting young and doing hard physical labour for most of your life with few other options for a job. "My father took me down the Albion when I was a small boy, and I could hardly wait to get old enough to work there. I knew nearly all about it, as my father talked about the pit so much, and the neighbours - that's the only language they spoke. And anywhere men were talking pit, my ears were wide open all the time." "I started in the pit when I was 13, driving a horse called Pete. I was so short the lamp on my belt used to hit the ground when I walked." "If I were a young man now and there were a mine going, that's where I'd be. People had more fun, more enjoyment underground. You could never expect to get a civil answer from a miner. And you never gave one. One fellow would pick chips off another fellow as a pastime. Insults were compliments. Everyone was one big, happy family." "The first day I went down a mine, I said to myself, `If I ever get out of here, they'll never get me back.' But I went back. And I loved it. A lot of it is just friendship: you look after me and I look after you." "The coal mines were a good place to work. You were your own boss. The boss told you what he wanted done, but all he had to do was keep the boxes to you and see that you kept the place safe. Sometimes you'd have to insult him to get him out of the place; he'd be keeping you back." "When times were tough we used to divide our work. The face was small enough already, but you'd take an extra man - three men in a nine-foot place. Then you'd stay home a day or two and they'd give other fellows work. If not, you'd starve, that's all there was to it." "The first thing I did after the MacGregor flooded was check the board in the lamp cabin to see if my brother was trapped." "I packed his lunch in the morning, so it would be nice and fresh. My husband liked cheese sandwiches, and peanut butter was his favourite; he said meat didn't taste good down the mine. And he just loved my poor man's molasses cake, with butter. His tea he took in a can, with a little bottle of milk." 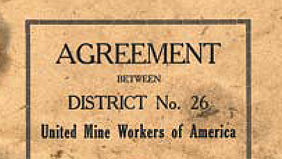 The United Mine Workers represented Acadia Coal miners from 1919 until mining ceased. 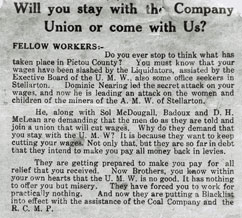 In 1925, British Empire Steel Company (Acadia Coal’s owner) offered its workers a 10% wage cut. The miners, having endured unpopular contracts since 1922, went on strike. They went back after five months, accepting a reduction in pay of six to eight per cent. "I saw women hollering their heads off, supporting their husbands." Soup kitchens were set up by the miners. At noon, the children would come, swinging lard buckets or cracker barrels, to be filled with the families' dinners. "We had a cow, a pig, and a couple of hens, so we always had something, but some didn't have livestock. Lots of people weren't properly fed. It was very bad. People had large families, and their father had to work hard to keep them clothed and fed. There were no savings." During the Depression Acadia's parent company went into receivership. The colliers had to contribute to buying the company out of debt. Feeling betrayed and deserted, a renegade union established itself. For several months conflict between the rebels - the Amalgamated Mine Workers - and the UMW divided the community. The strife finally ended in the defeat of the Amalgamated Mine Workers. "I was getting $3.78 as a shotfirer and they took one dollar off me for every day I worked. And if you were a digging coal, you paid more. It was a national disgrace." "We didn't want an American union; they were more interested in protecting United States coal markets at the expense of ours." The wounded coal community gradually re-found its communal heart. The fellowship of each other was important to them, particularly in sports, which they had enjoyed since the first colliers brought cricket, back in 1827. "You'd look forward to getting into the lodges, when you were 21. They used to put on parades, and funerals, get dressed up in silk hats and regalia." "I played near every game going, boxed, ran in five-mile races, threw horsehoes, played cricket. 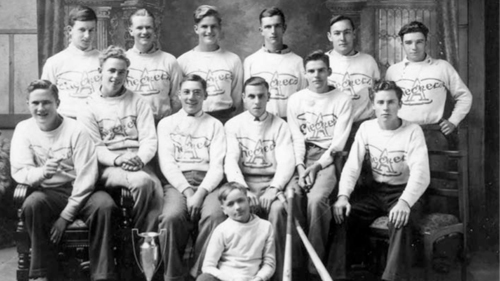 In the early '20s I played hockey for the Stellarton Amateurs ...."I played softball with the old Back Mines Moonshiners when Snatchel Jack MacKenzie was the manager, and later I played a few games for Evansville when the Asphalt Checkers were big." "The 12th of July Orange picnic was a provincial affair; they came from all over. The women cooked for days. They had big parades, garden parties, a dance pavillion put up, with orchestras, refreshment booths serving drinks and ice cream, carnival games. It was wonderful." 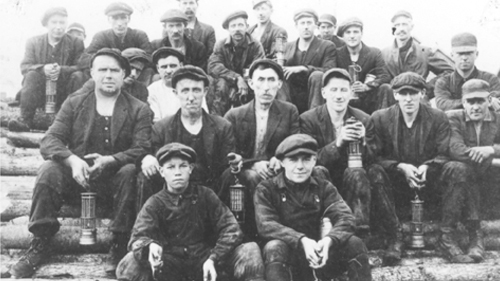 "I'll tell you one thing about the miners in Stellarton, they were dressed to the hilt. 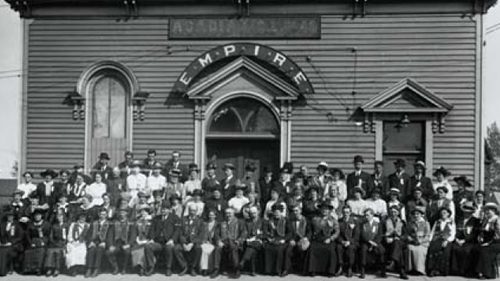 There were six tailor shops on the main street of Stellarton. You didn't know who a fellow was when he was out of the pit. You were one blade in your overalls, and another blade out of them."